Welcome to Ian's Shoelace Site! Fun, fashion & science in the Internet's #1 website about shoelaces and home of the Ian Knot, the world's fastest shoelace knot. Whether you want to lace shoes, tie shoelaces, stop shoelaces from coming undone, calculate shoelace lengths or even repair aglets, Ian's Shoelace Site has the answer! You can find out more about this site, or you can dive right in below. Are all of your shoes, sneakers and boots still laced up the way they were when you bought them? This section presents some of the many fascinating ways of lacing, either for different applications or just for appearances. Most people learn how to tie their shoelaces around the age of five. Why then would anyone older than that visit a website about tying shoelaces? Whether you're a parent, teacher, occupational therapist, academic, knot enthusiast, or just after some self-help, there's something for you. Do your shoelace bows sit vertically instead of across the shoe? Do your shoelaces always come undone? If so, you're probably tying a "Granny Knot". Learn how to keep your shoelaces tied by creating a "balanced" knot that sits straight and stays secure. The rhetorical question: "How long is a piece of string?" is a serious question when it comes to shoelaces. Too long and the ends can drag or get stepped on. Too short and it can be difficult to tie a knot. This section should help you work out the ideal shoelace length. Many people search for shoelace "tips" or "ends" because they want to know the name of the plastic or metal bits at the ends of shoelaces. They're called "Aglets", and you can find out more about them here, including how to repair or replace them. This section contains all sorts of tips, hints and ideas about shoelaces. There's tips for teaching children, tips for sportspeople, tips for the elderly and disabled, plus general tips for everyone. Ever noticed a group of people wearing the same color shoelaces? They're most likely part of a charity fundraiser or awareness campaign. Find out what the different colors represent, or better still, show your support by buying some shoelaces. You'll find the answers to Frequently Asked Questions here, mainly for the benefit of people typing those questions into search engines. It's also worth looking here before you send me a question for which I've already posted an answer. Shoelaces are common, useful items that are very much a part of our lives. Here's some "As Seen In..." moments where shoelaces make noteworthy appearances in movies, TV shows, the news, even the Bible. Here's some links to other shoelace and knot related websites. Providing links is good "Netiquette", enabling the Internet to effectively become its own index. 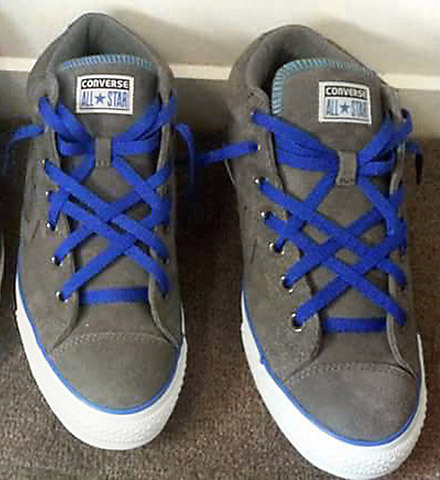 Grey Converse All-Stars with cyan & white trim and blue Lattice Lacing (from Bee R). Last of six different lacing photos on Bee's various sneakers. 14-Apr-2019 – Added news story about an autistic boy's lawsuit against police for using excessive force in attempting to arrest him after he innocently stopped to tie his shoelace. 10-Apr-2019 – Today I noticed that my YouTube channel has passed 20,000 subscribers. Thanks everyone for watching and subscribing – and please keep the feedback happening! 22-Mar-2019 – An additional 42 × diagrams were created of shoelace segments + shadows at slightly different angles in order to more accurately show the double-passes of shoelaces running through eyelets. 12-Mar-2019 – Added tutorial video of the Mega Ian Shoelace Knot, a variation of the regular Ian Knot tied using double-loops, making it much more secure (although much less fast). 26-Feb-2019 – Added two news stories involving shoelaces – one about Nike's self-tightening sneaker update fail, the other about thieves using a shoelace to steal mail. Stay informed of updates via Twitter or RSS, watch my videos on YouTube, "Like" me on Facebook (just for fun, as I don't find time for Facebook) or view my photos on Instagram. Background and other information about Ian's Shoelace Site. Maps the layout of the whole of Ian's Shoelace Site. This page last updated: 14-Apr-2019. Copyright © 2003-2019 by Ian W. Fieggen. All rights reserved.